This large-screen tablet retails for $249 USD and comes with a special free limited-time content offering. Barnes & Noble's latest NOOK reading device is not one that uses an e-ink display, but a large-screen Samsung Android tablet that has its advantages. The 9.6-inch Galaxy Tab E Nook edition is a great tool that allows users to enjoy the new entertainment features offered by Barnes & Noble, including videos, magazines, and comic books. The Galaxy Tab E Nook has the same technical specs as the "pure" version from Samsung - a 1.2 GHz Qualcomm 410 processor, 9.6-inch TFT multitouch display with 1,280X800 pixels, dual stereo speakers, 16 GB internal storage and microSD support up to 128 GB, WiFi connectivity, and more. The slate comes pre-loaded with Microsoft Office and customers also receive free content and Nook Store credit. 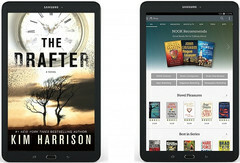 While the new Samsung Galaxy Tab E Nook is available at Barnes & Noble stores and online at Nook.com for $249.99 USD, Barnes & Noble Members receive an additional 10 percent discount. Until November 7, the company also runs a trade-in/trade-up program that offers a $50 USD credit to customers who own select Nook devices and are looking to replace them with a Nook Galaxy Tab E, Galaxy Tab S2, or Galaxy Tab 4. New York, NY – October 7, 2015 – Barnes & Noble, Inc. (NYSE: BKS) today expanded its offering of NOOK by Samsung devices and announced a special promotion to help even more customers trade up to one of its newest tablets at an even greater value. In conjunction with Samsung Electronics America, Barnes & Noble introduced the new 9.6-inch Samsung Galaxy Tab E NOOK, a large-screen tablet features Samsung’s stylish yet practical design with NOOK’s extraordinary reading and entertainment experience, perfect for the whole family and now available at Barnes & Noble stores and www.nook.com for $249.99 including a special free limited-time content offering. 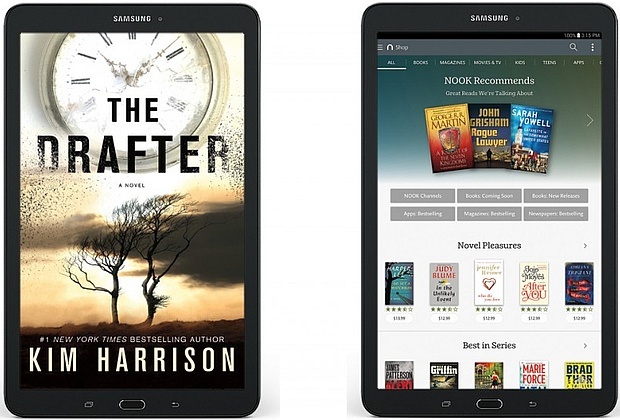 Barnes & Noble also launched a new Trade-In/Trade-Up limited-time in-store promotion to offer significant credits of up to $200 towards the purchase of a new NOOK by Samsung to customers who trade in select NOOK, iPad®, Kindle and Samsung devices* through November 7.